One of the benefits of a role as a Phlebotomist is the number of options available when it comes to advancing your career. Generally, these options include taking up a management or supervisory positions or becoming a donor phlebotomy technician. You can also study for a phlebotomy specialist certification to qualify as a collections phlebotomy specialist, registered phlebotomy specialist or patient service technician specialist. How Do I Become a Phlebotomy Specialist? One of the primary ways to increase your earnings and advance your career as a phlebotomist is to obtain additional qualifications and certifications. In order to specialise in a certain area, such as collections phlebotomy specialist, registered phlebotomy specialist or patient service technician specialist, you will need additional training that, in general, will require several years of experience in the field. These training courses are normally provided by your workplace, so it is best to discuss what training options are available with your employer. How Do I Become a Donor Phlebotomy Technician (DPT)? Donor phlebotomy technicians, or DPTs, often earn a significantly higher wage that a standard phlebotomy technician, with approximate earnings of $48,000 after working in the field for five years. In order to qualify as a DPT you will need a high school diploma or GED and be accepted onto a donor phlebotomy training program, many of which are available through staff training initiatives at healthcare providers. In addition to your GED, you must also obtain documentation completed by your immediate supervisor stating that you have successfully completed at least 25 donor collections and a Letter of Authenticity from laboratory management or your immediate supervisor. Can I Obtain a Nursing Degree While Working as a Phlebotomist? 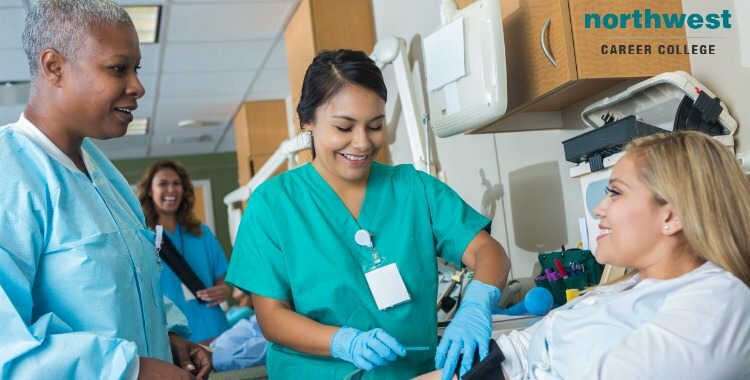 Working as a phlebotomist is an excellent starting point for obtaining a nursing degree, which can be studied for alongside your job by taking advantage of available evening, hybrid and online courses. There are several options available when it comes to nursing qualifications including a diploma from a hospital or accredited nursing program; an associate’s degree in nursing (two-year program); or a bachelor’s degree in nursing (four-year program). How Would I Become a Medical Laboratory Technician (MLT)? Medical lab technicians are in great demand with the number of roles available expected to rise by 22% over the next ten years. In order to become an MLT you must first obtain an associate’s degree and then complete an accredited training program for medical laboratory technicians. Once you have qualified as an MLT you have the career advancement option of becoming a medical technologist (MT) through experience or by obtaining a bachelor’s degree. According the other Bureau of Labor statistics, the starting annual salary for certified MLT is approximately $27,000, while a MT earns about $30,000. Previous Blog: Is Dental X-Ray Exposure Safe?Next Blog: Heart Attack Or Sudden Cardiac Arrest?